A thirty (no, make that forty....sigh) something rekindles his childhood interest in baseball cards on the other side of the world. After writing my last post about the fake 1994 Calbee Hokkaido/Kyushu/Sanyo Ichiros I flipped through my pile of "vintage" Calbee Ichiros from the mid-90s. I had some paranoid thoughts running through my head about whether they might be fake too, though I've never heard of any of his other Calbees being counterfeited. In that frame of mind I had a bit of a collector heart attack when I noticed something amiss with my 1995 Calbee Choco Snack Ichiros. As I mentioned in a post in February, I bought that entire set complete in their original transparent packs. I love that set. It has two Ichiro cards, numbered C-4 and C-32. As I also mentioned in that post, purchasing the entire set gave me a double of one card, one of the Ichiros which I had purchased individually about a year ago (highlighted in this post here). Somebody in this picture doesn't belong here!!! The one on the left (which is the one I purchased as a single last year) is number C-32, while the one on the right (that came with the set) is number C-4! But they are the same card on the front. At first I thought this might be an extraordinarily unlikely wrong back, but the likelihood of a wrong back which coincidentally had the same player on it was way too low to be realistic. I also considered the possibility that it might be a fake, but also discounted that: if someone was going to go to the trouble of making a perfect fake that looks identical to the real one and even somehow get it into an identical sealed pack, they'd probably not have made such an obvious mistake as putting the wrong back on the card! Also this is the black letter version which isn't really valuable enough to make it worth a counterfeiter's while like the 94 Calbees are. Finally after frantically scouring the internet I hit upon what seems to be the correct explanation for the discrepancy. 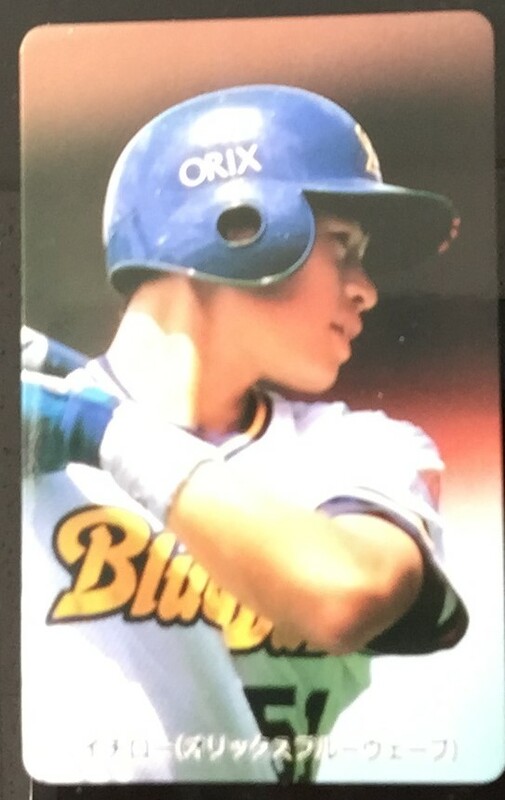 According to the Collecitng Ichiro website, there was a Chiba Lotte Marines Stadium promotional giveaway in 1995 in which a specially made Ichiro card featuring the front design and photo of C-4 from the regular set, and the back design (and number) of C-32 on the back was used. 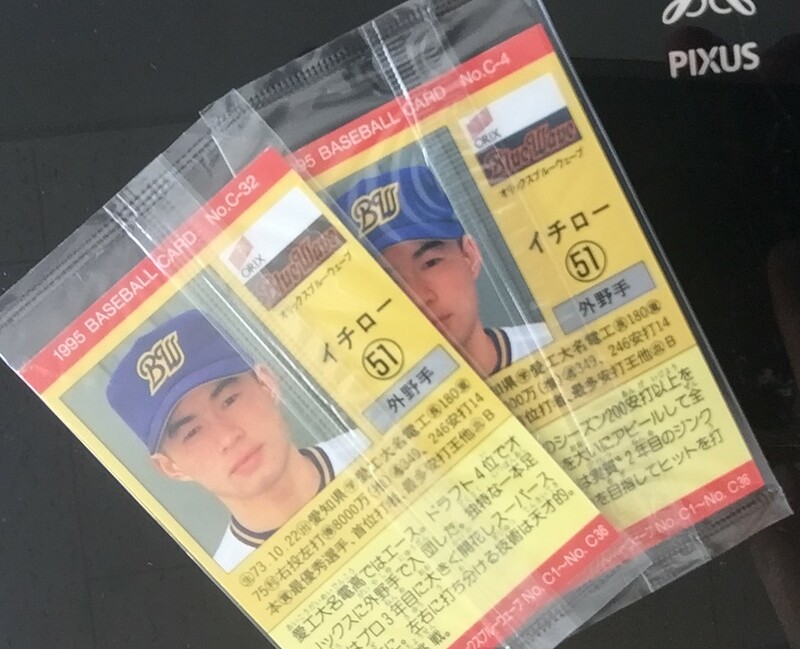 So the card that I bought as a single last year would seem to have been from that promotion and not from the regular set, even though except for the switched photo it looks exactly like a regular 1995 Calbee Choco Snack card. Looking around the Japanese internet and auction listings the variation seems to be a lot harder to find than the regular card, which I guess makes sense. Kind of a neat find, I had no idea this existed even though I've owned one for a year now, it can be fun to discover random things in your collection like this you never knew existed. A board member over on Net54 just drew my attention to the latest Prestige Collectibles Auction which has a really useful listing that I think is worth drawing everyone's attention to. 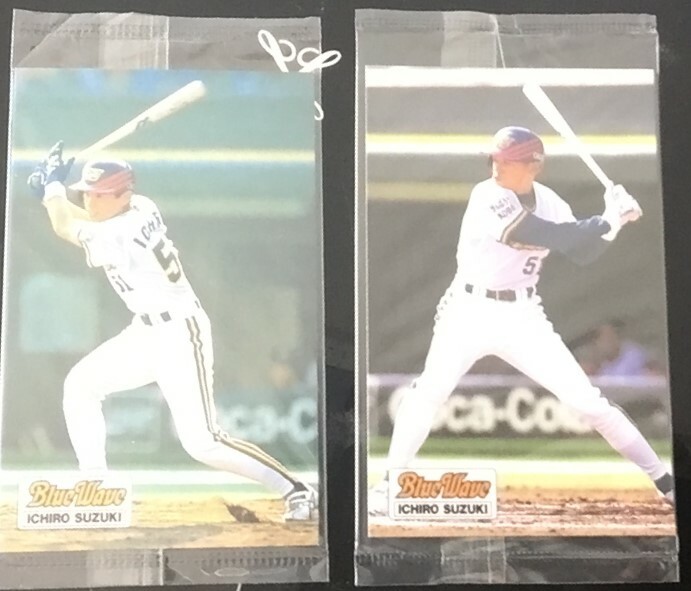 They have a 1994 Calbee Ichiro, card C-37 which is one of three Ichiros in the set, all of which are his first Calbee cards and all of which were regionally issued and are quite rare. The reason I wanted to draw the listing to everyone's attention is that it includes by far the best explanation of the differences between real and fake 1994 Ichiros that I've seen anywhere on the internet. Fakes of these three cards are everywhere, I even have one (the one pictured at the top of this post, C-39 from the set). They are extremely hard to distinguish from legit copies because they are almost perfect, made on the same cardboard and particularly on the front they are identical. 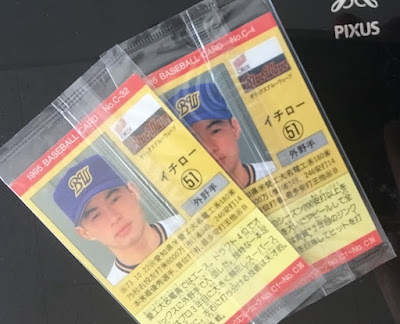 The only way to distinguish them is to look on the backs, the color of ink used by the fakes is not a perfect match and Ichiro's face has a bit of a purplish hue to it on the fakes (and the orange boxes with his biographical details are a bit darker). Go to the Prestige auction to see what I'm talking about because me just explaining it in words doesn't help much, they have side by side photos that lay it out so its super easy to spot, something which didn't exist on the internet until they put it up (at least as far as I'm aware). Another intriguing detail mentioned in the auction description was that the grading companies weren't aware of the fakes and graded a bunch of them, meaning that even a PSA holder isn't a guarantee that they are legit. I was curious how much of a problem that was here in Japan so I looked up the Yahoo Auctions listings since I remembered these are one of the few cards out there that routinely appear in PSA slabs here. Sure enough, looking through the auctions I couldn't find a single legit one among all the ones which had photos of the backs. Like this one here, a PSA 10 for 30,000 Yen but which has all the telltale signs of being a fake on it. And here is an ungraded fake with a starting bid of just 1,000 Yen that will be interesting to see how much it goes for. The Prestige auction says that 99.9% of the 1994 Ichiros out there are fakes and that it would be virtually impossible for anyone to assemble all three. I would quibble with both of those assertions - I don't disagree that a majority of the Ichiros out there seem to be fakes but I doubt its 99.9% (just doing the math if we conservatively estimate there are just 100 copies of each Ichiro, there would have to be 300,000 fakes to account for 99.9% of the total, and I don't think there are anywhere near that many). Also while difficult I have no doubt that there are collectors out there who have put together all three of the legit ones (sadly, not including me). But those are minor points of disagreement as the main point they make is absolutely correct: fakes of these cards are everywhere and its buyer beware. Actually I might add another minor point of contention. They and everyone else calls these the "Hokkaido" Calbee set, but it wasn't just issued in Hokkaido, it was also issued in the Kyushu and Sanyo (around Hiroshima) regions as well. Its pretty rare nonetheless! I am currently trying to put together the 1978 Yamakatsu set (along with the 1979 and 1980 ones). Jay, a member on Net54 who I have a trading relationship with (I send him Japanese cards, he sends me American ones, mostly Expos), kind of got me started on them a couple of years ago when he was putting his set together and asked me to find some. Looking for cards for him got me into them as well and now I sit here exactly one card short of finishing the set. If you ever work on that set, the last card you will need to get is of Isao Shibata. That was the last card Jay needed too and it took him forever to find one. Now its my white whale, I guess it was short printed as they are quite hard to come by. 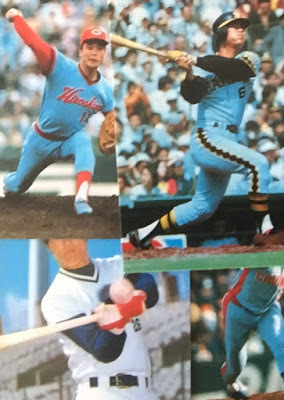 The thing I want to talk about in this post though is an odd detail I've noticed as I collect both Yamakatsu and Calbee cards from the late 70s. When buying Calbee cards from that era the vast majority of the ones you find are in low to mid grade condition. They are almost all "well loved", with rounded corners, creases and sometimes even kid's names written on them. I'm not a condition sensitive collector so this doesn't bother me much, all my pre-1990s Calbee sets probably average between vg and ex on the condition scale. If you were the PSA registered set builder type though you'd probably go mad trying to put together a vintage Calbee set - even the ones with sharp corners usually have some discoloration on the back (the result of existing in an extremely humid country!) The surviving cards are probably similar in condition to the population of surviving American cards of the 1950s. Yamakatsu cards on the other hand are the exact opposite. Almost all of my Yamakatsu cards are in the ex-mt to near mint or even mint range. This isn't because I've been picky about buying them, its just because almost all of the Yamakatsu cards I've come across are still in pretty pristine condition compared to the Calbee cards I've found. Without risk of exaggeration I think I could describe my 1978 Yamakatsu set (minus 1 card) as being in near mint condition, with nothing below exmt. I find this to be kind of mystery. My Yamakatsu and Calbee cards come from the same era and depict the same subject matter, yet they were obviously not collected by the same people back in the day. Calbee cards got a lot of love back then from kids, while Yamakatsu cards seem to have been treated much like adult collectors treat their cards today - in a way that preserves their condition. Which itself is odd since the modern hobby didn't exist in Japan (and barely existed in the US) back then. With Calbee cards, it isn't until the late 1990s that you notice an uptic in the number of cards that have been treated with care, and even with more recent cards from the 2000s its not unusual to buy a lot and find that half of them have obviously spent some time in someone's pocket getting their corners rounded. But even in the 1970s Yamakatsu collectors weren't doing that. I haven't come up with a convincing theory as to why that is. Yamakatsu cards were definitely marketed towards kids and not to adult collectors back in the day. The main difference between them is simply that Calbee cards came with bags of chips while Yamakatsu cards were sold as a stand alone product not attached to anything else. But that doesn't get us very far in explaining why they have survived so well in comparison to their Calbee contemporaries. Another thing is that some of the Yamakatsu cards on the market today are probably the remains of "dead stock" packs that nobody bought back in the day and thus they survived well. Some Calbee card packs also survived that way but probably in much smaller proportions than Yamakatsu ones. That is probably a partial explanation for why there are a lot of minty Yamakatsu cards around, but it doesn't tell us why there are almost no low grade ones, surely somebody bought some of these cards and played around with them back in the day? So where are those cards? Anybody have any clues as to what is going on here? Another cool thing I picked up on Yahoo Auctions recently arrived in the mail yesterday, an uncut sheet of baseball menko! I love these cards, the caricatures are quite amusing and colorful (very similar to these cards I picked up a few years ago, but not the same set). I am tentatively dating this to 1946 since the card on the upper right side is the "Gold Stars" team (Kinboshi), because the Daiei Stars went by that name in the 1946 season only. Also the one in the lower right is using the kanji that were (I think!) briefly used as a nickname for the Nishitetsu Senators (this is a tentative conclusion I am not 100% sure I'm right about this). The other team names are easier to figure out and square with what they were called in 1946 (and the late 40s in general). I'm curious about the caricatures on the front, they all have distinctive faces and I am curious if they are modelled after actual players. They are quite similar to this similar set here which did feature caricatures of players who were identified by name on the back. This set though doesn't list any names and it doesn't have any of players like Betto who are instantly recognizable so I'm not sure but hope to look into it more. Nippon Ham Sausage Set: Where are the Nippon Ham Fighters at? The 1975-76 Nippon Ham Sausage set is one of the hardest vintage Japanese sets to track down singles for out there. In 5 years of collecting them I only have 11 (the nine pictured above and these two here). You can read some of the basic information on the set over on Dave's site which has an excellent write up here. Despite having way fewer cards, this set is probably harder to complete than the much larger monster 1975-76 Calbee set that I am also working on (1472 cards in the latter, 351 in the former). There is a really odd mystery about this set which is unconnected to its scarcity which I thought I'd use this post to draw everyone's attention to. Its related to the fact that Nippon Ham, in addition to making this set, also owned (and still owns) an NPB team: the Nippon Ham Fighters. Now look at the cards I have - no Fighters. This isn't a coincidence, the set doesn't actually seem to have many Fighters cards in it and the few that do exist are much more expensive than the average cards, suggesting they were short printed (this absolutely beautiful card of Toshizo Sakamoto for example has a starting bid of 20,000 Yen right now for a mid grade copy). I don't have a checklist of the set handy, but do know that when you scroll through auction listings you will find a lot of cards of Giants players, and a fair number of Carp, Dragons and Tigers players. Players from other teams, including the Fighters, are way less common. This is not unique to this set, the Calbee sets from the 1970s are also dominated by Giants players and to lesser extents those other Central league teams which were popular at the time (and now). But Calbee didn't own its own baseball team, Nippon Ham did! So my question is why Nippon Ham didn't bother to put more emphasis on its own players in the set. I don't even mean over-representing them, but simply putting as many Fighters cards as they did Giants or Carp cards. It makes no sense. This is especially the case since in Japan the whole purpose of owning a baseball team is to promote the parent company, so logically you would think the same thinking would apply to producing a baseball card set. But it didn't, at least in this case. 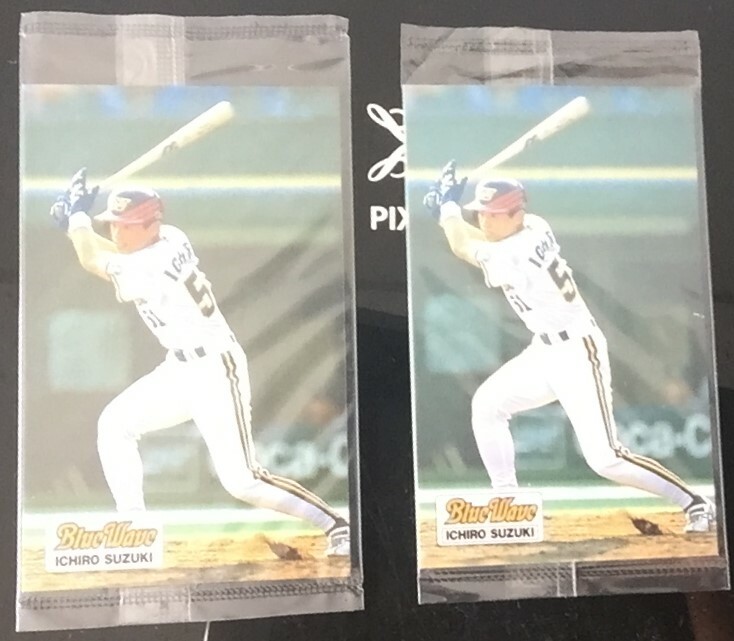 This is made all the more puzzling since Nippon Ham in recent years has rekindled its baseball card sets (in collaboration with BBM) and these sets ONLY feature Fighters players! 1) Division rivalries within the company. Maybe the guys in charge of the cards didn't like the guys in charge of the team. 2) Utter incompetence. Maybe the guys in charge of the cards didn't even think to put more cards of the company team in. Or maybe the people in charge of the team didn't even know the company was making a set and thus couldn't suggest the idea of putting more Fighters players in. 3) Closet Giants fans rearing their ugly heads again. So many people in the business world are Giants fans that its entirely possible this included the Nippon Ham employees in charge of the set who made the deliberate decision to flood it with Giants players despite the obvious conflict of interest at work. Not sure if there might be other explanations but any of these seems about equally plausible to me! 1975-76 Calbee Red Helmet Fight and Defend Series? 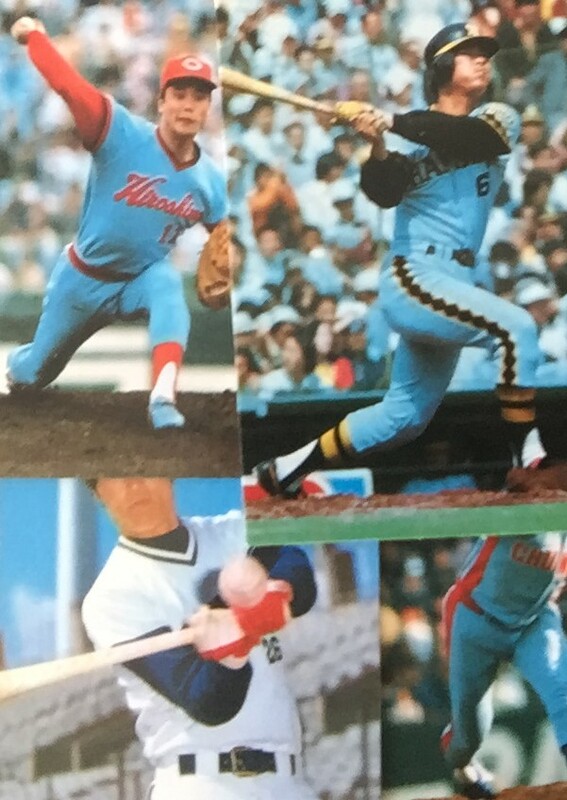 I reached another major milestone with my 1975-76 Calbee set today with the addition of the above card, #636 featuring a gaggle of Hiroshima Carp players and their manager on the mound. This card is a milestone for me since its the first card from the 赤ヘル攻防シリーズ series which runs from cards 609 to 644 and was only issued in Hiroshima. I'm not sure how to translate the title of the series as it provides the perfect demonstration of why when you read English that has been translated directly from Japanese it often sounds very awkward. The first part of the title can be cleanly translated as "Red helmets" and the last part as "series", but the middle 攻防 translates into "offence and defence" or maybe "fight and defend" which as you can see can be written with just two characters in Japanese but requires several words in English. "Red Helmet Fight and Defend Series" doesn't exactly roll off the tongue in English but I guess it will have to do. I have had some luck in getting cards from the other two regional issues in the set (one from Hiroshima, the other Nagoya), but these ones have been quite a bit more elusive. I have come to the conclusion based on my experience that these are probably in fact the hardest to find of all the cards in the entire set. This is contrary to what my copy of Sports Card Magazine (which is a few years old now) suggests as it lists these as the cheapest of the three regionals (commons at 5,000 Yen each, compared to 7,000 and 8,000 for the other two series). While all of the regional issues are hard to find, singles from this series seem to pop up about half as often on Yahoo Auctions and get higher prices than from the other two. I paid 2000 Yen for this one, which is the cheapest I've seen a card from this series go for, while I've been able to get cards from the other two (commons at least) in the 1,000 to 1500 Yen range. The 40th series in the set (cards 1400 and up) are also hard to find despite not being regional issues, but I've been getting singles for them in the 500 to 1000 Yen range so they are a bit cheaper. Anyway, it looks like cards from this series are likely going to be among the last I find for the set, which is coming along nicely. I've added a few dozen singles from the easier to find series so far this year and I think I must be at around 1,000 cards out of 1472 so far, though I haven't counted! I picked up my first graded Japanese card this week. 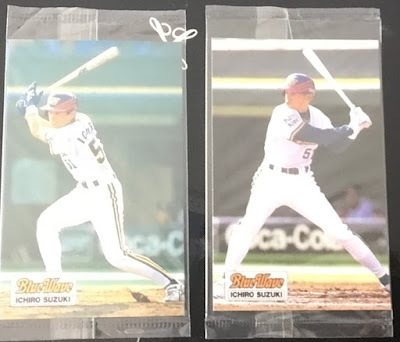 Its a 1995 Calbee/ Choco Snack, card C-32 in the set. I actually picked up this entire set just two months ago so I already have this Ichiro, but not THIS version of it. This is the harder to find gold parrallel version, which has his name written in gold rather than black letters. These generally sell for about double what the black letter regular versions of each card go for. I feel bad for the guy I bought this card from because I got an insane deal. The cheapest BIN prices or starting auction prices on this card (and the gold version of the other Ichiro from the same set) is 9,000 Yen right now, which is about normal. This one popped up with a starting bid of just 1700 Yen which I put in and won the card without anyone else bidding. It was an insane bargain. As I mentioned in an earlier post, graded cards are pretty rare in Japan, the hobby just isn't anywhere near as obsessed with condition as the American one is. All the other copies of this Ichiro card I've seen are raw rather than graded. I didn't buy this card because it was graded, but rather in spite of the fact that it was graded. Its cool to see that its in nm/mt+ condition but I could see that from the photos anyway. Its an almost perfect card - the front is flawless and the only thing that I can see which may have prevented it from getting a "Mint" grade is some microscopic flecks of white on a bit of the edge on the back. But the cost of having it graded by the seller must have cost almost, or maybe even more than, the amount I paid for it. It just makes so little sense that I can only imagine the guy is kicking himself for having gone to the expense. In the US I guess getting cards like this graded is kind of like playing the lottery that you'll get a Gem Mint grade and hit the big bucks. So you might take the hit on stuff you got with lower grades. But in Japan I don't think it works like that. It makes no sense that I got this card in this condition - its basically perfect - for this price. I don't know if Japanese buyers were avoiding it because it was graded and they just don't know what that is or how to value it, or if I just lucked out. Or is it like the US, where once it is established that a card has an insanely minor flaw and won't get a Gem Mint grade, the bottom falls out of the market for it. I find the latter really doubtful given the way the market works here. Anyway, I'm happy with this card in my collection. I don't think I'll go for the entire gold parallel version of the set because...why would I? But its cool to have a sample of one and that sample being an Ichiro! I collect baseball cards and I live in Japan. My mission is to complete every regular Calbee baseball set ever made. This is more like an aspirational goal rather than a realistic one, I'm not made out of money, but I'm going to stick to it and see how far it goes. This blog has a lot of info on Calbee sets from the 70s and 80s in particular, but also a bunch of other stuff. Hope you enjoy reading it! Stuff I found at my parent's house 1: The oldest card in my collection. Why isn't this a rookie card?